This brief comment highlights a specific problem for the Christian kingdom in particular, and suggests a broader question that can be applied to any of the Crusades, but will be considered here for the battles that were to occur following Hattin: how did economic constraints and resource limitations help to shape the events of the Third Crusade? Both King Richard of England and Saladin, the Sultan who ruled Palestine, Egypt, and Syria, were burdened with very different limitations on their resources and logistics. It is interesting that these limitations were proportionately crippling to the military might of each side which, in the end, resulted in a stalemate that shaped the landscape of the Holy Land for a century after the conflict. Following the victory by Saladin over the Christians in 1187, the cities of the Crusader States fell rapidly. It was in response to this defeat of most of the Christian Kingdom in Palestine that King Richard, German Emperor Frederick Barbarossa, and Philip Augustus, King of France answered the call to crusade by Pope Gregory VIII, who replaced Urban III after his death toward the close of 1187. The logistical and resource obstacles could scarcely have been more challenging. Of all that once comprised the Outremer, only Tyre remained. It was decided that Emperor Barbarossa would move his massive army overland and enter Palestine through Byzantium in the North, while Richard and Phillip Augustus would sail with their armies to Tyre. As King Richard marshaled his forces, he faced the same daunting challenges as his predecessors in waging war in Palestine. The expedition had to be funded, forces raised, and then transported from Europe to the Levant. Neither in regards to manpower nor in equipment could the Outremer supply itself. The Christian kingdom had ruled over a primarily Muslim population who (except for local bands of mercenaries called the turcopoles) were not likely to rise up in her defense. 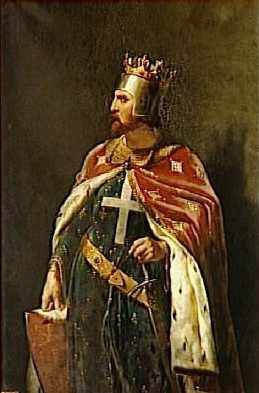 To raise funds, Richard (or more accurately, his father Henry II) imposed a tax on his English subjects, called the “Saladin Tax”, which equated to a tenth of a subject’s income. If the subject volunteered to fight in the Crusade, he was exempted. This tax, then, provided cash for the military endeavor as well as volunteers. To move these forces, the Kings of France and England commissioned over 100 ships, from the English fleet (for Richard’s army) and the fleets of the Genoese and other ports in Europe (for Philip Augustus and the French). The number of soldiers moved is not entirely certain, but seems likely to have totaled, between the English, French, Genoese, Danish, and assorted other nations’ contributions, to just over 15,000 troops. This did not include the remaining forces still in the Holy Land, which would bring the available forces to approximately 20,000. To collect sufficient funds, gather the manpower, and then to deploy during an accommodating sailing season (spring and summer) would take at least a year. The movement of soldiers and supplies was not the greatest of King Richard’s logistical challenges, as significant as that was. As already stated above, horses were critical to the military might of the Franks (as the Muslims referred to all Christian Crusaders). In order to transport these horses, ships had to be built specifically for this purpose. The animals were fitted into slings that prevented them from lying down. This rough transport degraded the horses’ effectiveness until given sufficient time to recover. When Richard reached Cyprus, for example, the horses had been suspended in their slings for a month, and “injured by being tossed about on the sea…” So when the King pursued the fleeing Emperor of Cyprus, his men “spared them [the horses] and went at a moderate pace.” It would take “a season” for the horses to recover. Once the Crusaders passed Cyprus, they were generally assured of safe passage. For most of the 12th century, the Christian kingdoms of the Mediterranean had enjoyed a relative naval superiority in the east. However, this was not absolute. Between the years 1179 – 1187, only two years before Richard’s arrival in Palestine, Saladin’s son Nuradin had led a surprising resurgence of Egyptian naval power. This naval force was credited with the Muslim capture of Acre from the Christians in 1179. However, disaster struck as Saladin attempted to drive out the Christians from their last remaining foothold at Tyre in 1187. Taken by surprise while attempting to blockade the city, the Muslim navy was destroyed and the Christians would control the sea, providing a vital (and now reliable) line of communication between Europe and the Holy Land. Two years later, the Arab chronicler Bahā’ ad-Din observed this naval superiority during the Crusader siege to reclaim Acre. “The Franks…had posted their ships all round Acre to blockade the harbor against Muslim shipping. The besieged were in dire need of food and provisions.” In order to covertly provide some relief, a Muslim ship from Beirut was disguised as a Christian vessel (complete with pigs on the upper deck and flags depicting the cross). This vessel, according to Bahā’ ad-Din, was able to enter the city. This may have been a minor victory, but clearly Saladin was unable to leverage any true naval might in his fight with the Christians. Had he possessed a credible naval capability, it surely would have impacted Richard’s ability to move forces at will via sea. Even after retaking Acre, Richard relied on his ships to ferry supplies up and down the coast during the early portion of the campaign, as well as to communicate with his closest allies in Tyre. The social dynamic at work in the region in regards to the Muslim view of naval power is one of the most interesting limitations on Saladin’s forces, and it greatly benefited the Christians. 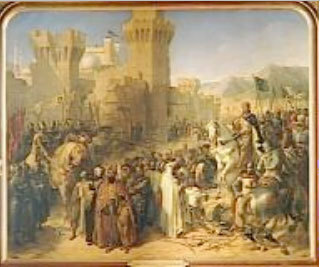 While Saladin was able to exercise complete freedom of movement around the Crusader forces on the land to the north, east, and south, had he the capability to at least harass Richard’s ability to resupply and move troops along the coast, the length of the Third Crusade may have been significantly shorter. Historian Susan Rose points out that, although Saladin himself may not have shared it, there was a pervasive Muslim contempt for naval power during this time. One contemporary Arab observer referred to defeated Muslim naval crews as “peasants and rabble,” and scornfully stated “Anybody given an oar can row well…” Perhaps indicative with how little regard was given to Muslim sailors, Rose points out that in contrast to Mamluk ground commanders, no written biographies of Mamluk naval commanders exists. But the use of the sea was slow, and Saladin was well aware of the limitations in manpower faced by his Christian adversaries. Six months before Richard departed by ship, Emperor Barbarossa reached Constantinople and prepared to cross through Byzantium and enter the Levant. Saladin, in an exchange of letters, warned the Emperor, “If you count the Christians, my Arabs are many times more numerous. If the sea lies between us and the Christians, there is no sea to separate Arabs who cannot be numbered. Between us and those who will aid us, there is no impediment.” From Egypt, Palestine, Syria, parts of North Africa, and into Mesopotamia, Saladin had a theoretically vast amount of soldiers to answer his call to jihad. These resources, however, proved to be far from limitless. The Arabs were a mix of peoples who were often no more prone to cooperation than the feuding kingdoms of Europe. 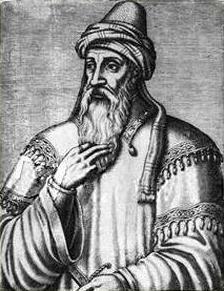 Despite the vast Muslim lands surrounding Palestine, Abu Shama lamented, in disgust over the lack of response to Saladin’s call for jihad to resist the new Crusades, “Not one of them [the Muslims] has responded to the call, not one intervenes to straighten what is distorted…” Even though Saladin’s unification of the lands from Egypt to Syria was an astonishing feat, his ability to marshal an army against the Crusaders remained hobbled by disparate forces reluctant to work together. By the time King Richard’s forces landed in the Holy Land, Saladin’s army numbered perhaps 25,000. This lack of cohesion often robbed the Muslim forces of what could have been a decisive combat advantage in terms of numbers and logistics. 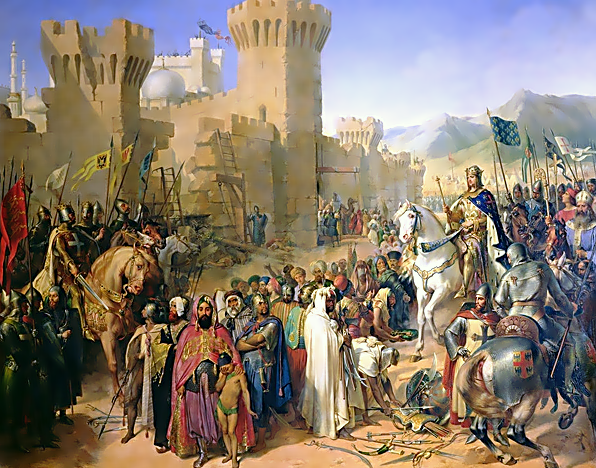 During the hard-fought siege of Acre, as the Crusaders were on the verge of victory, Saladin prepared another attempt to break through the besiegers to reach the Muslims trapped within the city walls. However, his army refused to follow him. In June 1191, the city of Jaffa was being heavily contested between Christians (who had control) and Muslims. King Richard led a force that drove off Saladin’s army just as the city was negotiating surrender. Saladin commanded his army to re-attack the city, but they refused. Saladin was furious, and considered executing his emirs. Fortunately, he gave himself time to calm down after this example of insubordination. However, his emirs began to question the Sultan’s leadership, and again refused to attack the Crusaders as they marched toward Haifa. To make matters worse, following a demoralizing route near Arsuf in September 1191, some of Saladin’s leaders began to wonder whether reinforcements would be willing to come now that they had been so decisively beaten at Acre and Arsuf. It was after this defeat, in October, that the two sides began to discuss a peace treaty. As described above, both Muslim and Christian forces had significant logistical and resource constraints throughout the years 1189 – 1193. The very nature of these weaknesses precluded either side from capitalizing on the shortcomings of the other. Richard had very real limitations to the number of soldiers he could field, equip, and feed. In fact, some speculate that when discussing their peace treaty, Richard made concessions (specifically the surrender Ascalaon, the southernmost port closest to Egypt) in part because he was ill, but also because his coffers were nearly empty. Just as significant, Saladin’s diffusive military was never able to repeat the victory at Hattin. The Arab reluctance to fight on the sea provided Christian forces a somewhat dependable line of communication which enabled Richard to wage an effective war. Many battles were fought, and both sides were led by strong leaders. But the specific weaknesses of the warring forces helped to prevent either of them from securing complete victory. The most significant consequence of the Third Crusade was that it reestablished the Crusader Kingdoms in the Holy Land. The toe-hold of Tyre, all that remained of the Outremer in 1187, had grown to include much of the coast of Palestine. The Christian presence had a new lease on life that Saladin was unable to prevent. However, since Jerusalem and most of the rest of Palestine remained in Muslim hands, Richard could not claim a complete victory. Both Saladin and Richard were considered brilliant warriors and leaders, but in the end their unique resource and logistical limitations forced them to compromise, and so neither achieved what they truly wanted. It may be that both sovereigns did have some future plans on completing their missions, but neither would live to execute them. Richard of Holy Trinity, Itinerary of Richard I and others to the Holy Land. Cambridge: Publications Medieval Latin Series, 2001. Arab Historians of the Crusades. Trans Francesco Gabrieli. Berkley: University of California Press, 1984. Lynn, John A. ed. Feeding Mars: Logistics in Western Warfare from the Middle Ages to the Present. Boulder, CO: Westview Press, 1993. McLynn, Frank. Richard and John: Kings at War. Cambridge, MA : Da Capo Press, 2007. Montefiore, Simon Sebag. Jerusalem: The Biography. New York: Vintage Books, 2011. Reston Jr., James. Warriors of God. Richard the Lionheart and Saladin in the Third Crusade. New York: Doubleday, 2001. Rose, Susan. “Islam Versus Christendom: The Naval Dimension, 1000 – 1600.” The Journal of Military History, vol. 63 no. 3 (July 1999) 561 – 578. 1. James Reston Jr., Warriors of God: Richard the Lionheart and Saladin in the Third Crusade (New York: Doubleday, 2001), 40. 2. James Reston Jr., ibid, 10, 94 -95. 3.Frank McLynn, Richard and John, Kings at War (Cambridge: Da Capo Press, 2007) 128. 4. James Reston Jr., ibid, 210. 7. Frank McLynn, ibid, 182. 9. Richard of Holy Trinity, Itinerary of Richard I and others to the Holy Land, (Cambridge: Publications Medieval Latin Series, 2001) 128. 10. Timothy J. Runyan, ibid. 11. Susan Rose, “Islam Versus Christendom: The Naval Dimension, 1000 – 1600,” The Journal of Military History, vol. 63 no. 3 (July 1999) 568. 13. Arab Historians of the Crusades, trans Francesco Gabrieli, (Berkley: University of California Press, 1984) 200. 15. Richard of Holy Trinity, ibid, 164. 16. Susan Rose, ibid, 569. 18. James Reston Jr., ibid, 116. 19. Arab Historians of the Crusades, ibid, 214. 21. Arab Historians of the Crusades, ibid, 217. 22. Simon Sebag Montefiore, Jerusalem: The Biography (New York: Vintage Books, 2011) 173. 23. James Reston Jr., ibid, 216. 25. Arab Historians of the Crusades, ibid, 225. 26. Frank McLynn, ibid, 217.